Reflexology is an ancient tradition, currently gaining momentum as an alternative, holistic remedy to stress and pain. 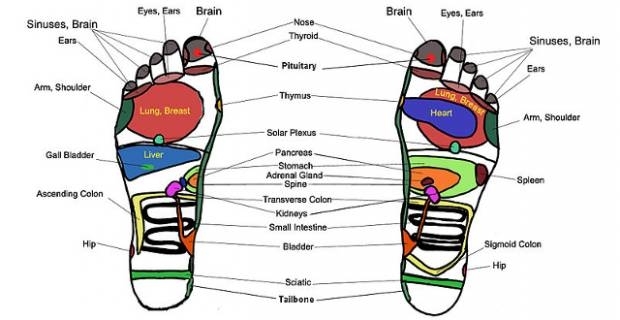 Based on the belief that everything in the body is connected via energy lines, reflexology acts on specific pressure points on the foot and hand that correspond to other points in our body, mainly related to our main organs and the spine. Fin out more in guide to the ancient practice of Reflexology. Reflexology, also known as zone therapy, is an ancient Chinese practice that uses pressure and manipulation of specific points on the foot, hand and ear in order to stimulate the parasympathetic nervous system. Stimulation of the parasympathetic nervous system is believed to re-activate the free flow of our life-energy, thus promoting self healing. Established more than 3,000 years ago, this particular sort of massage is used to re-balance the life-energy or life-force (called Qi) which is responsible for our well being. Our Qi flows through energy channels, which run through the whole length of our bodies, and when we're running low on it, conditions like pain and stress, or even disease, appear. In order to regain our balance, and the normal state of bodily and mental health, any energy block must be dealt with and removed. It is believed that applying a carefully measured pressure to specific points on feet, hands, or ears, sends calming messages from the peripheral nerves to the central nervous system. The central nervous system, in turns, signals the body to adjust its tension levels, thus enhancing relaxation. In a relaxed body everything works better: internal organs and their systems are in their natural state of optimal functioning; blood supply in enhanced, increasing oxygen and nutrients to the cells and promoting elimination of waste and toxins; circulatory, respiratory, endocrine, immune systems are all affected positively. At the bases of the traditional practice of Reflexology there is the ancient belief that the body is able to heal itself. This notion is becoming more and more popular, in a time where more people than ever look at alternative, holistic approaches to health and well-being. Reflexologists see their practice as a 'healing art', aiming at bringing the whole person back into balance so that the mind is relaxed and focused and the body can nurture and repair itself.